On the cusp of the anniversary of Rosa Parks’ courageous stand for civil rights, The College of New Rochelle Community came together to celebrate the opening of the new, expanded Rosa Parks Campus in Harlem, as well as the civil rights icon herself, during a ribbon cutting ceremony on Thursday, November 29, at the campus’ new location at 313 W. 125th Street. 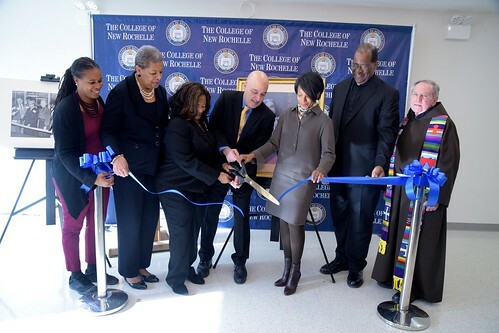 A broad cross section of the CNR Community—trustees, faculty, staff, alumni, and students—as well as Harlem community leaders were present for the event at the technologically advanced campus when the announcement was made that, for the first time, the College will offer nursing degree programs at the Rosa Parks Campus through its School of Nursing & Healthcare Professions. CNR will continue to offer its signature adult learner degree program through its School of New Resources, which it has offered in Harlem since 1981. The new 21,000 square-foot campus, just one block from the Apollo Theater, occupies four floors with classrooms, a nursing simulation lab, a library and Learning Commons, computer lab and offices, and more than doubles the space of the College’s previous campus in Harlem. December 1 marks the anniversary of Rosa Parks’ refusal to give up her seat to a white passenger on a Montgomery, Alabama city bus, which subsequently led to the Montgomery bus boycott initiated by Dr. Martin Luther King, Jr.
“On December 1, 1955, Rosa Parks made a decision to resist the status quo and that decision became a catalyst for the Civil Rights Movement,” said Latimer. Father Joseph Flynn, OFM Cap., CNR Chaplain, and Father Gregory Chisholm, SJ, Pastor of the Church of St. Charles Borromeo/Chapel of the Resurrection, opened the event with a blessing. “I bring greetings of his Eminence, Cardinal Dolan, who asked that I convey his belief that The College of New Rochelle is salt and light to this community, and whereas we don’t want salt to go sour, we don’t want light to be put under bushel baskets. We want salt to be vibrant, and we want light to be illuminating for hearts and minds,” said Father Chisholm, who attended on behalf of Timothy Cardinal Dolan, Archbishop of New York. Former New York State Senator and now Special Advisor to New York Governor Andrew Cuomo for Policy and Community Affairs, Ruth Hassell-Thompson, shared a letter from the Governor sent to mark the occasion. Hassell-Thompson then went on to speak about the importance of education. “As I stand here today to celebrate the Rosa Parks Campus, I encourage you to support it,to enhance it and to encourage our young people that a good education, a good opportunity, is only at the end of that rainbow if they're willing to put in the work, and we will do what is necessary to continue to make colleges and opportunities for education beyond high school possible for them because the world in which they're going to have to take control is going to command a knowledge that is based upon how much they know about the world in which they are going to live,” she said. When the College opened its Harlem location in 1981 as a campus extension for its School of New Resources, it was the only four-year college located in Harlem. In 1987, the College received approval from New York State to establish the Harlem extension as a campus and classes moved into one floor of the Studio Museum on 125th Street. On September 15, 1987, the campus was officially named in honor Rosa Parks, who attended the dedication ceremony. CNR was privileged to enjoy a special relationship with Rosa Parks, who was present at CNR on several occasions, including at the celebration of the 20th anniversary of the School of New Resources in 1992.